Nine people have died in Cairo in overnight clashes between supporters and opponents of ousted President Mohammed Morsi, officials say. Most of the victims were killed at a sit-in held by pro-Morsi demonstrators near Cairo University. Mr Morsi's family earlier accused the military of abducting him. He has been held at an undisclosed location without charge since army chief General Abdul Fattah al-Sisi announced his removal on 3 July. Demonstrators, many of them from the Muslim Brotherhood, have been staging large rallies across Egypt. The violence has claimed at least 100 lives since Mr Morsi was deposed. Pro-Morsi supporters claimed they had been shot at by snipers on rooftops during the clashes at the sit-in, the BBC's Quentin Sommerville, in Cairo, reports. They alleged the gunmen had received protection from security forces, our correspondent adds. Meanwhile, one protester was killed at Cairo's Tahrir Square, while two more people died outside the capital. On Monday, at least one person died and dozens of protesters were wounded during the unrest in central Cairo, medical officials said. Egyptian state TV reported that seven pro-Morsi protesters had been arrested for possession of illegal weapons. More deaths were reported in separate clashes in Qalyubiya province, north of Cairo. On Monday, Mr Morsi's family said they had had no contact with him and confirmed they were appealing to the International Criminal Court to launch an investigation into the events leading up to his overthrow. Earlier this month, the Egyptian public prosecutor's office said it had launched an investigation into complaints against ousted Mr Morsi and members of the Muslim Brotherhood. These complaints included allegations of spying, inciting violence, attacking military barracks and damaging the economy. The prosecutor did not specify who had filed the complaints. 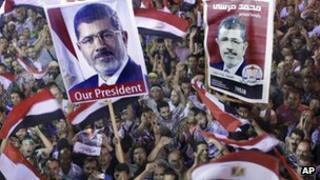 Several countries, including the United States, have called for Mr Morsi's release. But Egypt's caretaker authorities insist he is being held in a "safe place". Interim President Adly Mansour repeated calls for reconciliation in a nationally televised speech on Monday evening. "We want to turn a new page in the nation's book of history, without rancour, hatred or confrontation," he said. Mr Mansour has appointed a panel of experts tasked with amending the constitution, which was suspended when Mr Morsi was deposed. The interim leader plans to hold fresh parliamentary elections by early 2014. But the Muslim Brotherhood has rejected any "national dialogue" with the army unless Mr Morsi is reinstated, along with the now-dissolved upper house of parliament and the suspended constitution.